Tydd Gote Angling Club have been working hard to ensure the North Level Drain continues to improve and with the help of the Environment Agency they have already seen a healthy restocking policy take place. There is now even more good news to report as the club along with the EA were over at Rookery Waters recently to net one of the fishery’s lakes and remove literally thousands of small perch and fry. I was there to witness the job in hand which took the best part of the day as it was a mammoth task hauling huge nets across the lake then having to pull them in full, and I mean full, of fish. The carp, big perch, tench and quality roach all went back into the lake, so the job was to sort the fish and remove what needed to be transferred over into the fen drain. Thanks should go to all the anglers that went along to lend a hand, and the club would like to thank Rookery Waters for their genorosity in letting them have so many fish to restock. Rookery Waters has seen some major improvements carried out over the past few years and it has quickly grown into one of the best fisheries in the area. But they not resting on their laurels and the lake they netted is to get the full makeover treatment, a credit to the owners and fishery manager Alex Bates. Hot on the heels of news that Peterborough & District AA will be running their own matches on Ferry Meadows and the River Nene for the first time in many years, the club have now announced they have been awarded a national event on the river to take place in late summer 2018. I understand the match is to be fished on the North Bank of the River Nene with close to 300 anglers taking part. Webbs AC returned to fish Float Fish Farm Fishery on Sunday to try their luck on the Horseshoe Pool. But like most waters, it was hit hard by the frosts and bitterly cold winds returning. Leading the way with 16lb 13oz was Martin Delegate. He was on peg 22 and caught on a small feeder with sweetcorn. Runner-up was Colin Clarke, who fished a feeder with red maggot for 11lb 3oz, then came Mick Wright on 10lb. Results from Ramsey & District Angling Society matches on the Old Nene at Ramsey St Mary shows the venue is still producing some fine sport. In the Wednesday match Liam Harlock took the honours with 16lb 4oz on peg four. He started on the pole with maggots followed by a good run on hempseed. Second was Harry Young on peg two with 13lb 15oz followed by Keith Rayment on 11lb 8oz. On Sunday a huge 21lb 9oz took first place. That belonged to Jim Broadbent, who caught quality roach on hempseed. Second place went to Malc Sansome with 13lb 4oz, followed by Dave Chamberlain with 9lb 15oz and Ken Taylor completed the frame with 9lb 8oz. Over on Ramsey Narrows the Angling Trust Pike Qualifier produced 24 pike for a total of 145lb. First place went to Martin Smith with five fish for a total of 30lb 8oz. Second was Enzo Serino with 28lb 6oz (5 fish) then came Paul Keepin with 23lb 12oz and Paul Lenton on 19lb 12oz. What a great venue Beggars Bridge on the Twenty Foot is turning into, or should I say returning to its former glory days. 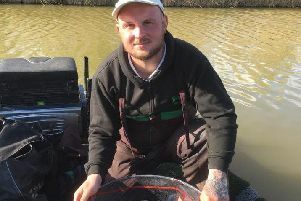 Whittlesey AA’s Chris Gale on peg two fished a tidy match with some quality roach to lead the way weighing in 23lb 9oz. Second from the opposite bank was Mark Barron with another good net weighing 17lb 07oz. In third place was Jeff Tuttlebee fishing the whip and waggler approach for 14lb 11oz.